Esse quam videri is a Latin phrase meaning "To be, rather than to seem". It and variants have been used as a motto by a number of different groups. The form Esse, non Videri ("To be, not to be seen") is the Wallenberg family motto. Esse quam videri is found in Cicero's essay On Friendship (Laelius de Amicitia, chapter 98). Virtute enim ipsa non tam multi praediti esse quam videri volunt ("Few are those who wish to be endowed with virtue rather than to seem so"). Just a few years after Cicero, Sallust used the phrase in his Bellum Catilinae (54.6), writing that Cato the Younger esse quam videri bonus malebat ("He preferred to be good rather than to seem so"). Previous to both Romans, Aeschylus used a similar phrase in Seven Against Thebes at line 592, at which the scout (angelos) says of the seer/priest Amphiaraus: οὐ γὰρ δοκεῖν ἄριστος, ἀλλ᾽ εἶναι θέλει (ou gàr dokeîn áristos, all' eînai thélei: "he doesn't want to seem, but to be the bravest"). Plato quoted this line in Republic (361b). 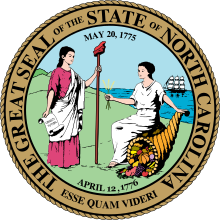 Great Seal of North Carolina with the state motto esse quam videri. Esse quam videri is the state motto of North Carolina, adopted in 1893. Groton School (1884), Groton, Massachusetts, USA. The motto changed to Cui Servire est Regnare ("To whom to serve is to reign") shortly after the school's founding. The Hermitage School (1906), Geelong, Australia; which has subsequently become that of The Hermitage House, Geelong Grammar School. The Hemel Hempstead School (1931), Hemel Hempstead, England. St. Joseph's College in Patchogue, New York, United States. St. Malachy's Memorial High School, Saint John, New Brunswick, Canada. Delta Phi Epsilon sorority, founded in 1917 at New York University Law School. House of Susan B. Anthony, founded exclusively at The King's College NYC. Alpha Chi Lambda, founded in 1998 at Trinity University in San Antonio, TX. Phi Gamma Nu, National Professional Fraternity in Business, est. Northwestern University 1924. Lambda Kappa Sigma, founded in 1913 at Massachusetts College of Pharmacy. Kingswood Rugby Football Club, Bristol, UK, use a variant Esse Non Videri as their club motto. White Wolves MC, Oradea, RO, use a variant of the motto, Esse Quam Videri Malim as their club motto. Outcast Cyclists, U.K. and worldwide use Esse Quam Videri as their club motto. Swire Group esp. its shipping branch, The China Navigation Company. The phrase is found on the Sibley Mill along the Augusta Canal in Augusta, Georgia. The structure was completed in 1882 and operated until 2006. The phrase is found on the bottom of bottles of gin from the Isle of Harris, Scotland. the honor society The Order of Scroll and Key at Dickinson College. The Archon Society at Kenyon College. The National Honor & Merit Scholars Society. the Carolina Wilderness EMS Externship, a wilderness EMS training program based in western North Carolina. the Brigham Young University Men's Chorus. No. 77 Squadron RAF (active during three periods between 1916 and 1963) used the variant, Esse potius quam videri with the same meaning. The U. S. Consortium of Metropolitan Medical Directors (Eagles). The Pan Hellenic Society of Silliman University, Philippines. Television personality Stephen Colbert inverted the statement on his show The Colbert Report to Videri Quam Esse, meaning "to seem to be rather than to be." It is also engraved across the faux hearth, above the video fireplace, in his studio, under his portrait. The funk metal band Mordred features a song called Esse quam videri on their 1991 album In This life. ^ "Family". Wallenberg.com. Retrieved 24 December 2018. ^ "North Carolina State Motto Esse Quam Videri To Be, Rather Than To Seem". Netstate. Retrieved 2018-04-06. ^ "Wat is the NC State Motto? -Our State Magazine". Retrieved 2018-04-06. ^ "home". Connellspt-p.schools.nsw.edu.au. Retrieved 2010-07-12. ^ "desertheightsprep.org". desertheightsprep.org. 2003-03-01. Retrieved 2012-01-26. ^ "Darwin_High_School". Schools.nt.edu.au. Archived from the original on 2010-10-31. Retrieved 2010-07-12. ^ "esquimalt.sd61.bc.ca". esquimalt.sd61.bc.ca. 2010-08-27. Retrieved 2012-01-26. ^ "Home". Hemel Hempstead School. Retrieved 2010-07-12. ^ "The motto of the University is Esse Quam Videri ...." "Bulletin, National University of Health Sciences" (PDF). Archived from the original (PDF) on 29 December 2010. Retrieved 11 March 2011. ^ "Pages - Welcome!". Stm.nbed.nb.ca. Retrieved 2012-04-20. ^ "Seton Hall High School". Retrieved 2011-03-05. ^ "essequamvideri.co.uk". essequamvideri.co.uk. Archived from the original on 2012-03-04. Retrieved 2012-01-26. ^ "Thomas Jefferson Classical Academy: A Challenge Foundation Academy". Tjca.org. Retrieved 2012-01-26. ^ "truroschool.com". truroschool.com. Retrieved 2012-01-26. ^ "Villa Devoto School". vdevoto.esc.edu.ar. Retrieved 11 September 2017. ^ "Woodward Career Technical High School Official Web Site". Cincinnati Public Schools. Retrieved 2012-03-25. ^ "wyoarea.org". wyoarea.org. Retrieved 2012-01-26. ^ "dphie.org". dphie.org. Retrieved 2012-01-26. ^ "tkc.edu". tkc.edu. Retrieved 2012-01-26. ^ "phideltaalpha.com". phideltaalpha.com. Retrieved 2012-01-26. ^ "Alpha Chi Lambda". San Antonio: Trinity University. Archived from the original on 2012-07-17. Retrieved 2012-07-04. ^ "lks.org". lks.org. Retrieved 2012-01-26. ^ Burt, Martyn. "kingswoodrfc.co.uk". kingswoodrfc.co.uk. Retrieved 2012-01-26. ^ "White Wolves MC Romania - Esse Quam Videri Malim". www.whitewolvesmcromania.ro. Retrieved 11 September 2017. ^ "Outcast Cyclists - Esse Quam Videri". Outcast Cyclists - Esse Quam Videri. Retrieved 11 September 2017. ^ "Swire". www.swire.com. Retrieved 11 September 2017. ^ "nhmss.org". nhmss.org. Retrieved 2012-01-26. ^ "Carolina Wilderness EMS Externship - Official Home Page". Blueridgehealth.org. Archived from the original on 2012-04-02. Retrieved 2012-01-26. ^ "Men's Chorus Philosophy: Esse Quam Videri,". Brigham Young University. Retrieved 2012-11-07. ^ "Gathering of Eagles". www.gatheringofeagles.us. Retrieved 11 September 2017. ^ "Pan Hellenic Society". www.panhellenicsociety.com. Retrieved 31 October 2017. ^ "Stephen Colbert's new Latin motto". talkshownews.interbridge.com. 2010-01-17. Retrieved 2014-12-31. This page was last edited on 22 April 2019, at 12:33 (UTC).